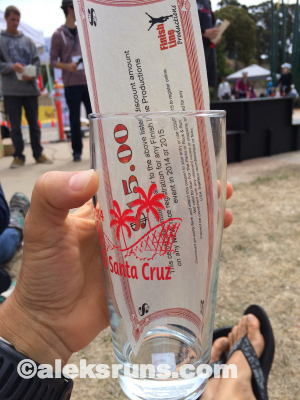 Tri Santa Cruz is a local, somewhat low-key event in – yes – Santa Cruz, Calif. I will tell you about the “somewhat” later. First things first: location. Beautiful, beautiful! 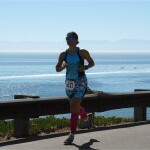 I raced the Santa Cruz Triathlon there last year and fell in love with it, especially the run course, out and back along West Cliff drive and with stunning ocean views throughout: I can’t do the race again this year because of a scheduling conflict, but I wanted to race in Santa Cruz at least once. 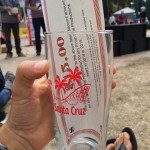 So with a little over a week to go, I signed up for Tri Santa Cruz. 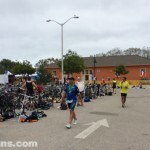 There were quite a few options to choose from with this race: sprint or Olympic distance triathlon, sprint duathlon, and a sprint and international distance dip and dash aquathlon. 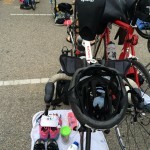 I chose the sprint tri because I thought it was on Saturday — why, when the website clearly stated Sunday, August 10, I don’t know? Anyway, good thing I realized my error in time and, come bright, dark and early Sunday morning I was once again navigating the twisty-turny Hwy 17 to Santa Cruz. Transition was set up in the exact same place as the Santa Cruz Triathlon, except now we each had pre-determined rack spaces marked with our bib numbers. That took some race-morning confusion out of the picture, which was nice. In other awesome news, there was an actual bathroom right by transition (on the side of the red building in the photo below), plus plenty of porta-potties. You know I never fail to report on the potty situation at races, right? #detailsmatter So, drink away your pre-race coffees, my friends, there are plenty of places to “go” – sans wait – before the race! 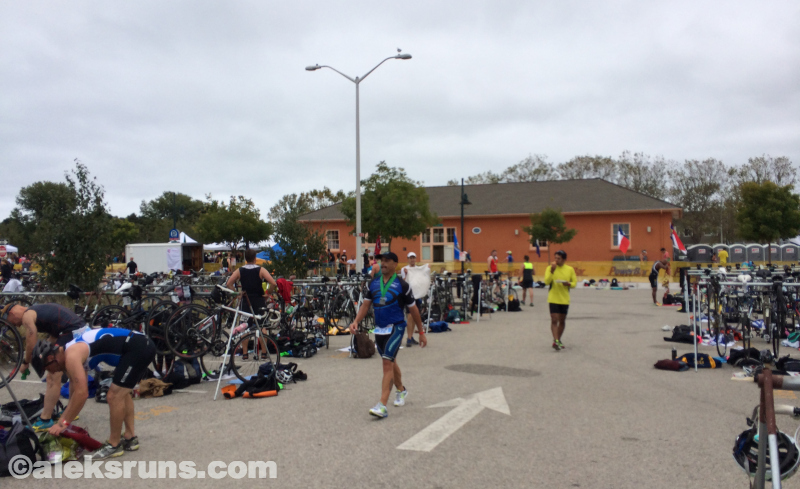 Speaking of racing, it was hardly 7:30 when we all got ushered out of Transition, to head towards the swim start. My official wave start was at 8:39, so I thought that was a wee bit rushed, but what can you do. 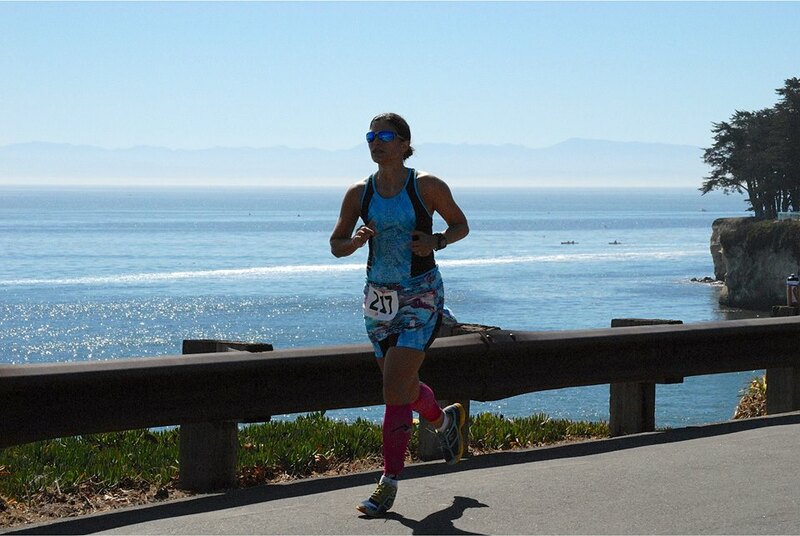 Quickly squeezing into my wetsuit, I grabbed my swim cap and goggles, kicked my flip-flops in the tri bag and pitter-pattered – barefoot – the nearly half-mile over to the beach. First, all wave starts were delayed by 10 minutes. So my “warm-up” dip in the ocean – water: not so chilly at this time of year, but I was glad to have a wetsuit! – turned into a “let’s hang out in the water for a while” thing. I almost did a false start, too: saw a large group of hot pink caps run into the water and sprinted over, only to find out this is the Olympic distance. Turned out, the organizers had the same color caps for sprint and oly distance women (hot pink), as well as some of the men (yellow). That was confusing! Anyway, my real wave start came soon enough and we all sprinted into the water. I jumped in and started pushing like it was my job. Coach D said to go fast, it’s a short distance so just go for it. 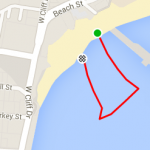 I did go for it, but considering my mediocre swim skills… well, at least I got to stay with my swim wave! Nothing interesting to report, except that I saved 15 seconds or so by not putting socks on. I passed a bunch of people on the way out – OK, a lot of people – but also got passed by crazy-fast dudes who were racing the Olympic distance. Don’t know how they do it. 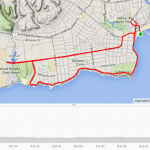 The bike course for Tri Santa Cruz is two laps for the sprint distance and four for the Olympic. 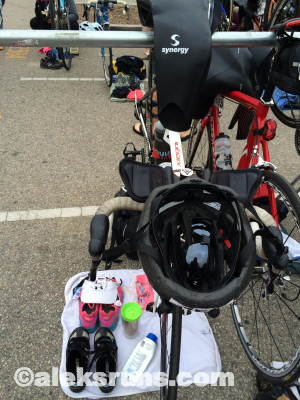 (Another reason why I chose the sprint… Two times around gets boring, with four I would’ve lost count!) 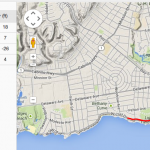 There was a u-turn before we headed back to ride along West Cliff drive, with winding right and left turns. Helmet off, visor on; slip bare feet into Zoot shoes (comfy!) and off we go. 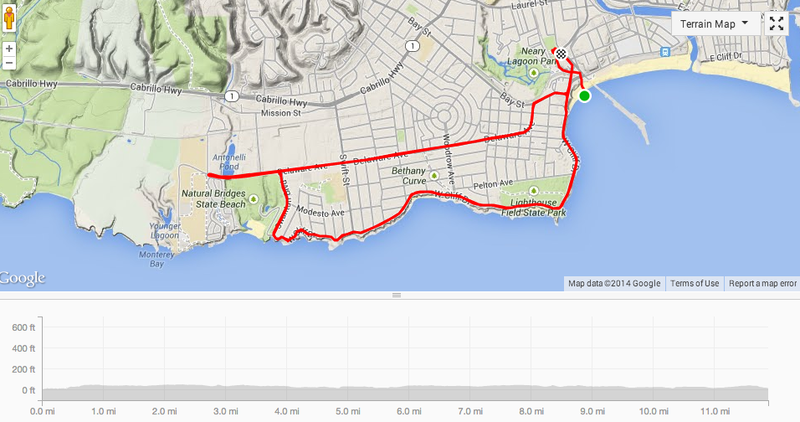 The run was just as flat as the bike. In hindsight, I should’ve pushed the pace more and suffered. It was only for a little bit! 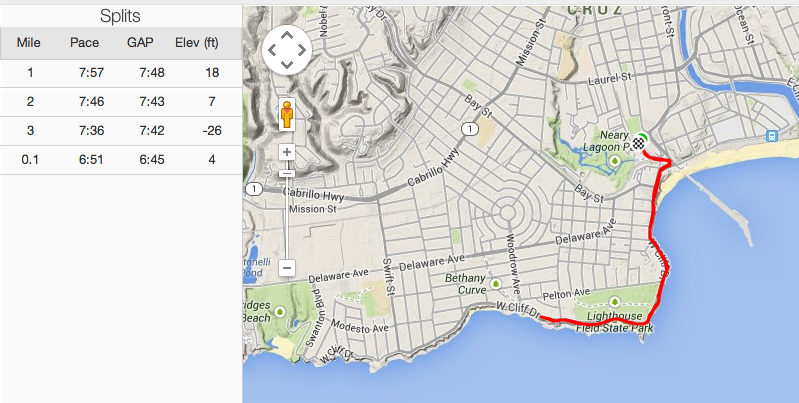 I crossed the finish line – right by transition – with an official run time of 24:15, avg 7:48 pace. Definitely could’ve gone faster. Oh well. The official results took quite a while to come out – more than an hour after I finished, in fact! That was annoying. There were very few finishers when I arrived, so I figured I maybe did well – but had no way of knowing unless I waited… and waited. Finally, the results were posted and I found out I had won my age group and placed 6th female overall!